When it comes down to comic book universes, at least one character usually serves as the company mascot. DC has both Superman and Batman. Marvel has Spider-Man. Image, Spawn. When it comes to Valiant Comics, though, that flagship title belongs in the hands of Aric of Dacia, better known as X-O Manowar. In Valiant's original continuity, Aric was a powerful warrior and heir to the throne of the Visigoths, a nomadic tribe in conflict with The Roman Empire. That all changed, however, when he was abducted by the Spider Aliens, a race of, well, spider-like aliens that forced Aric and other prisoners into slave labor. A chance encounter between the Spider Aliens and Solar allowed Aric to grab the control ring for Shanhara, a Manowar Class Armor, in order to return to Earth, only to realize that several centuries have passed thanks to Time Dilation. Now trapped in the present day (aka The '90s), he befriends Ken Clarkson, a schemer who helps Aric take over as CEO of a corporation called Orb Industries. Hilarity (and awesomeness) ensues. 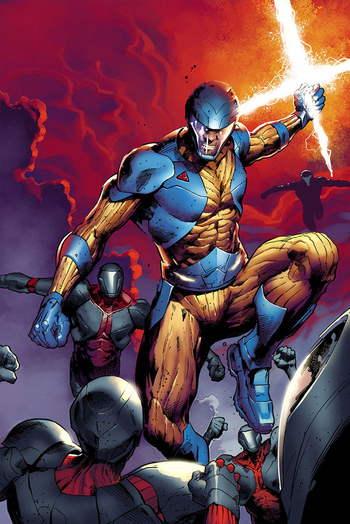 On September 2016, Venditti's run of X-O Manowar came to a close, ending at 50 issues.note Plus an issue #0, an Annual issue and two one-shot specials It was relaunched in 2017 with Matt Kindt (the previous writer of the rebooted Rai comic) as writer and various artists. Awful Truth: To the Vine's perspective at least. The priest finds out that the prophecy of Shanhara bonding with a Vine and leading them to greatness is a farce created by the Vine Council. Shanhara cannot and will not bond with any Vine members, but it will bond with humans or any other race, and their religion has been pretty much fabricated. Barbarian Hero: A very unconventional take on this trope. Take the Powered Armor from Aric and you have a straight example that fits like a glove as a Visigothic warrior who is considered a barbarian by the Romans, and he has problems adapting to modern civilization. Challenging the Chief: Aric becomes king of the former Visigoth slaves in Loam and takes them to Earth. However, the former leader of the group Volo is pretty resentful of this whole affair. He eventually challenges Aric for their leadership in a one-on-one fight without armor, and Aric wins. However, instead of killing him, Aric spares Volo saying they shouldn't fight among themselves and earns the latter's respect and friendship. Cargo Ship: In-Universe. The Shanhara considers itself beyond bonded to Aric... They are wedded. In the 2017 series, it takes the form of an ring to symbolize their alliance. Dark Messiah: Aric becomes this for the some members of the Vine after bonding with the Shanhara armor, since he is considered their messianic figure but he is also consumed with hatred and fury for enslaving him and his people. Even after the prophecy is revealed to be a fluke, he still fulfills the role of saving them eventually. Defector from Decadence: Alexander Dorian is a Vine plantling that rebels against his superiors when they decide to invade and destroy Earth because he is fond of his native planet. Enemy Mine: The Vine becomes unexpected allies to Aric to fight the Torment, the creatures from Loam's distant past that enslaved them. Fantastic Racism: The Vine look down on humans as animals and one of the reasons that their warrior cast want to destroy Shanhara instead of preserving it is that they are outraged it would have picked a human instead of them. Fighting for a Homeland: When Alric discovers Visigoth's descendants in the Vine homeworld, his primary motivation is to find a home for his people, relocating where Dacia used to be in modern-day Romania. Aric expresses resentment that his rivals the Huns managed to form a home of their own in Hungary while practically nothing remains of his people except museum artifacts. They are ultimately relocated to America in exchange for his work with the government. Fish out of Temporal Water: Aric, natch. The rescued Visigoths also count. Because of this, the entire revived Dacia is essentially a Fish Bowl Out of Water. Handicapped Badass: Aric briefly becomes one before his bonding to Shanhara as he gets his hand chopped off by his Vine slavemasters, yet he succeeds in pulling off a slave revolt where he kills several aliens with just one hand. After bonding with the armor, his chopped off hand is regenerated. In the 2017 series, he is this trope again when he renounces the armor and as such loses his regenerated limb. That doesn't stop him from becoming a successful soldier of fortune in an alien planet. Her Heart Will Go On: Aric discovers upon returning to Earth in the 2017 series, his estranged wife Sanna has married Volo and had a child with him. Hive Mind: The Vine's collective consciousness allows them to function like this. Insectoid Aliens: The Vine are a mix of this with plants with their heads resembling ants. Laser Blade: X-O is able to generate one, which he likes to use when he's not blasting people in the face. Last of His Kind: Aric is the last still surviving Visigoth in present day. Subverted when its revealed that the Vine kept several of his people as slaves in their home planet Loam. Visigoth Soldier: There is no telling how many legionnaires hide inside that behemoth. We should exercise caution. Aric: [charging] GIVE THEM NO QUARTER! Same Visigoth Soldier: Or we could attack now. This is desconstructed as a friend of Aric's blames his brashness for costing them everything and letting the Vine take them captive. And before that, his own uncle Alric chided him for leading his men into battle recklessly. Aric explains that he fights alone and he doesn't really want to lead the men, they follow him because they chose to and it wasn't his intention to lead them to their doom. Long Runner: At 50 issues, it is the longest-running title that Valiant has ever (and, given their track record, will ever be) produced. Mechanical Lifeforms: Shanhara, and by extension all of the Manowar armors, is a strange combination of an alien plant and a borderline-sentient machine. Outliving One's Offspring: The reason behind Aric's exile at the start of the 2017 series; in the intervening time between the two series, him and Sanna had a son but he developed leukemia due to radiation exposure from the armor and died soon after. She blamed Aric for their son's death and since he simply couldn't hand the armor to someone on Earth, he chose to depart from it altogether. Outside-Context Villain: At first, Aric's greatest enemies are the Romans. Then he and his squad come across the Vine. Later followed by the Torment. Powered Armor: The Manowar armors in a nutshell. Replacement Goldfish: Aric had a wife called Deirdre whom he was dedicated to rescuing, but unfortunately she is long dead by the time he returns to Earth. He finds love again when he falls in love with Sanna, a Visigoth slave girl from Loam. Well-Intentioned Extremist: The Armor Hunters are right in that a Manowar armor can eventually take over its host if it becomes damaged enough. Their mistake comes from thinking the armors are thus an uncontrollable virus and treating them as such.